For a complexion as clear as the Arizona sky, you’ll want to go to Clear Sky Dermatology. We worked with this client to design a website that would have a clinical feel to it while still providing inspiration and encouragement for those seeking dermatological services. From the opening imagery to the footer, we worked with the client to produce an incredible and gorgeous website that would inspire and enlighten the visitor while encouraging them to envision how beautiful life can be after a dermatological treatment. The website design is a very clean, linear design with a fairly standard presentation of elements. Traditional designs exist because they simply work, and we didn’t want to wander too far from the basics with this website, instead focusing on presenting the personality of the office through a selection of colors and images that would help create an approachable and clean website. Effective coordination and communications with the client ensured that the result represented exactly what they were looking for while including all the fundamental design elements that would make it pop to prospect patients. The foundation of this website is a very simple and traditional white, a color that has long-standing associations with a clinical setting, as well as professionalism and purity, all elements that tie very well into the concept of a dermatological website. The blue is a common element when looking to inspire calm and hope in the viewer, and for those seeking dermatological care, it’s a strong indicator for the blemish-free future they’re hoping for. These colors repeatedly appear throughout the site in every element from the blue skies and waters of the portraits in the slideshow to the clothing and protective equipment worn in the images. 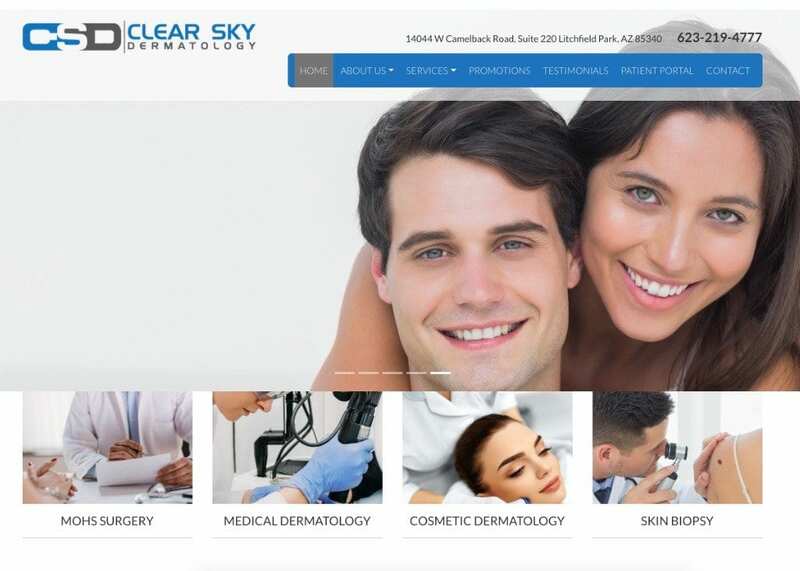 The various design choices that went into this website have helped focus it on the desired outcome of visitors looking for services like those provided by Clear Sky Dermatology. From the opening shot, it’s clear that visitors are encouraged to explore the various procedures and services offered by the clinic, and make an appointment to begin their journey to beautiful skin. It’s no mistake that the Skin Biopsy displays a common mold that can often be a sign of something more malignant, as it seeks to connect visitor experiences with practice. The marketing elements on this website primarily lean on producing a feeling of familiarity with the visitor. For those who enjoy an outdoor life dermatological treatments can be essential to long-lasting health, especially as sun damage can cause visible effects on the skin. From beauty to health, this dermatologist’s website encourages the viewer to make an appointment and get treated by advanced dermatological technology. It represents a straight and to the point dermatological environment without any frills or unnecessary salesmanship. It’s clear this office isn’t interested in selling the viewer snake-oil but instead is dedicated to providing high-quality dermatology services that will help extend the health and beauty of their patients.